A new daily game has been released in the Lost City of Simeria. Archeology can be played once every 24 hours. Go digging for rare simerian artifacts and you may find rare new Simerian Keys, MP or even Dukka Coins! The Lottery has been drawn for this week. EuroKillz is the winner of the 414,300MP Jackpot with the winning numbers of 4, 8, 19, 11, 18 and 15! Congratulations! Last Week's Raffle has now ended. is the winner of the Red DNA and 100,000MP prize with the winning raffle ticket number 1962! Congratulations! Make sure you buy your tickets for today's raffle - only 10MP per ticket! An ancient Temple has just opened for you to explore in Simeria. Its very dangerous, so you can only send in one pet at a time and while the pet is inside the temple, you cannot trade or exchange the pet. Make sure you are prepared - the temple has many obstacles, 30 levels some say, but not many have made it all the way to the treasure deep inside! While inside the temple, your pet will see ancient symbols on the walls or floor which will help him safely proceed to the next level. But you will need to use Runes to help translate. At each level of the Temple, you will get a prize. It can be either items, currency, pet stats or Account Upgrade Credit. There is no time limit for completing the Temple, but you can only complete one level every 24 hours. If you manage to reach level 30, you will be able to change your pet to ANY COLOUR costume you want! The Simerian Statue was built thousands of years ago, before Simeria was destroyed. It has survived all of the wars and has watched thousands of years of history develop around it. You can leave 100MP at the statue and it might share some of it's wisdom and knowledge with one of your pets and help it gain school stats. You can visit the fountain once every 5 hours. Can you find these 3 new Hidden Avatars? The Lottery has been drawn for this week. xxxWINXxxx is the winner of the 10,300MP Jackpot with the winning numbers of 6, 4, 10, 12, 21 and 13! Congratulations! Last Week's Raffle has now ended. is the winner of the Red DNA and 100,000MP prize with the winning raffle ticket number 88! Congratulations! Make sure you buy your tickets for today's raffle - only 10MP per ticket! The Lottery has been drawn for this week. Scorpio123 is the winner of the 297,700MP Jackpot with the winning numbers of 6, 4, 10, 21, 12 and 25! Congratulations! Last Week's Raffle has now ended. is the winner of the Red DNA and 100,000MP prize with the winning raffle ticket number 4537! Congratulations! Make sure you buy your tickets for today's raffle - only 10MP per ticket! The Lottery has been drawn for this week. spocktari is the winner of the 763,500MP Jackpot with the winning numbers of 15, 5, 8, 17, 19 and 23! Congratulations! Last Week's Raffle has now ended. is the winner of the Red DNA and 100,000MP prize with the winning raffle ticket number 30321! Congratulations! Make sure you buy your tickets for today's raffle - only 10MP per ticket! The Jenoa Goals now has 19 new levels! You may of noticed that the site is running a lot faster recently and the majority of the site's bugs and glitches have been fixed. We are still continuing to fix the remainder of the site. We do still however have a major problem with the main hardware the site uses which needs replacing. The replacement is really expensive and has taken us the past 3 months to save up for! We hope to be able to move to the new system this week but until then we will have the site randomly crash and get Server Errors almost all around the site! When the site is moved to the new system and we finish fixing the remainder of the site, the site will not have any major problems or downtime again! The Lottery has been drawn for this week. crusaderx2 is the winner of the 757,400MP Jackpot with the winning numbers of 18, 20, 5, 10, 23 and 15! Congratulations! Last Week's Raffle has now ended. is the winner of the Red DNA and 100,000MP prize with the winning raffle ticket number 20600! Congratulations! Make sure you buy your tickets for today's raffle - only 10MP per ticket! The new July Account Upgrades have been released! There are 2 different themes - Explorer and Light Fairy! Here are some of the items you can get this month.. The Light Fairy themed Account Upgrade has the following items..
And with both Account Upgrades you will 7 random pieces of the new Simerian Explorer Treasure Map. Completing the map will give you access to a new Quest, the Explorer and you can get Runes for completiting quests. Runes have the runic alphabet on then and are one of many ancient languages lost inside of Simeria. You will need runes to translate writings on the wall inside one of the Simerian Temples. It will be released next week and until then you won't know anything else about the Temple! We have been very busy fixing old bugs and glitches in all of our Flash Games. We still have to fix a few small bugs and the send score feature on the latest 5 games, but bugs in the older games have now been fixed! Even Undead Billiards is now glitch free and that game has been broken for nearly 2 years now! We hope to have every bug in every game fixed by the end of next week. If you play any of the games from today and find any new bugs, please post on my blog and we'll get it fixed! Who likes the new Light Fairy and Explorer costumes? A brand new quest, the Simerian Explorer has just been released in the Lost City of Simeria. 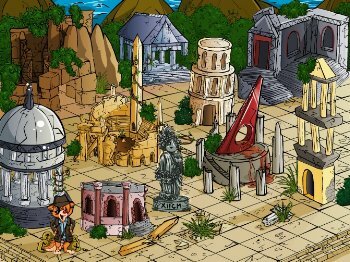 The lost city of Simeria is in ruins for an unknown reason. Only recently discovered, the world has so much undiscovered history. Why was the city destroyed? What happened to the rest of the Simerian tribe? There are so many questions to be answered! That is why explorers spend so much time in this world. The new Simerian Explorer Treasure Map is part of the July Account Upgrades being released later today! The Lottery has been drawn for this week. pandagirlrules is the winner of the 751,800MP Jackpot with the winning numbers of 23, 6, 2, 14, 4 and 18! Congratulations! Last Week's Raffle has now ended. is the winner of the Red DNA and 100,000MP prize with the winning raffle ticket number 353! Congratulations! Make sure you buy your tickets for today's raffle - only 10MP per ticket! We now accept SMS Payments for Account Upgrades in 30 different countries! If you live in one of the countries listed below, you can use your mobile/cell phone to buy Account Upgrade credit! If you have a credit card, you should continue to use Google Checkout though as the rates are better and there is a 20% extra credit promotion still! You can now also once again sent Postal Payments to either me or Laimay in the UK or Canada. We accept cheques/checks, cash and money/postal orders. The canadian address will be added tomorrow. You will also be given the postage costs in extra credit for any payments posted to the UK P.O Box. The Dukka Caves Goals now has 19 new levels! The Dukka Caves Goals has also finally been added to the Dukka Caves map!